Eco-friendly products for schools, businesses, universities and other institutions have become incredibly important. It’s time to equip yourself with the latest in environmentally friendly pencils to get with the times and help contribute to a better future for our planet. Recyclable pencils do not skimp out in the quality sector. They use high-quality leads and sharpen perfectly. Our recyclable pencils are not only awesome writing implements that come with super-strong high-quality leads, they’re also recycled from a variety of materials for eco-friendliness and sustainability. 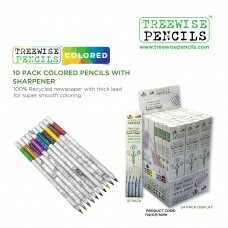 Recyclable pencils have become popularised with the famous plantable pencil. This pencil is created from recycled material and each one contains a different seed in the end so it can be planted when the pencil has been used! 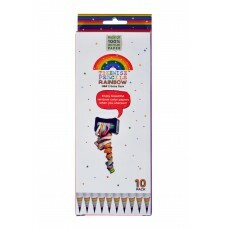 Not only is this a superb novelty for kids and adults alike, it also works and you can grow plants like tomato, mustard, fenugreek, coriander and chilli. They genuinely work and make awesome side projects for schools. 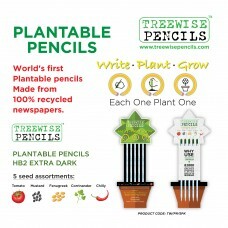 We stock these plantable pencils alongside other high-quality pencils that have been created from recycled newspaper. 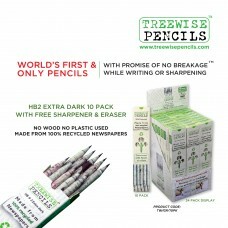 We’ve opted to cooperate with manufacturer ‘Treewise’ who have a superb track record when it comes to manufacturing well priced but fully recycled pencils. 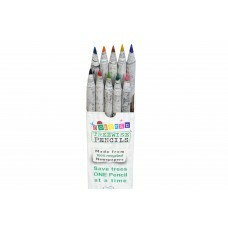 We stock pencils that range from standard HBs to coloured pencils. Each pencil is built to the same quality as a normal pencils but due to their environmentally friendly design, they have a much reduced impact on the environment. Pencil wastage is a big contributor to the poor sustainability of the office and stationery industry. Align your business or school to a new eco future and reduce your carbon footprint today.